The toys in the list below have gone on for miles and miles around here. We played with them continuously, together, as a family. Adults, teenagers and little kids alike. Many we had to replace because they fell apart from being played with so much. If you know me in person, your family has probably gotten some of these from us as gifts at one point or another. Whether you are making a holiday list or just looking for a present for any occasion, this list is handy. Play Tent and it’s fancier cousin The Playhut Luxury House: These provided hours of play for the littlest ones, and now, sometimes I find my big kid sitting in the play tent and reading a book. Parachute: This parachute lived in the trunk of my car. We would pull it out at play dates, in waiting rooms, in the park, everywhere really. 12 feet is all you need. Wooden Blocks: This is a fantastic thing for anyone with a builders mind set. My little architect spent hours. I know there are Legos, Lincoln Logs and more, but none of them were as much fun as the plain wooden blocks. We had a large bag, and he’d build space stations, castles, and more. We would put up towns and defenses and then try to knock each other down. Last man standing wins. 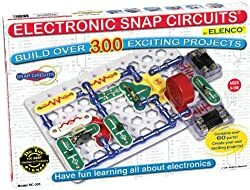 Snap Circuits: Snap Circuits were a really great toy for my budding Electrical Engineer. I have to warn you though, while the box says ages 8 and up, my younger kiddo was much more amused with them (under adult supervision) then his older brother. Parachute men: It is a basic toy that is basically awesome! I love playing with things that fly, and it’s fun for the kids too! Rocket Balloons: another classic toy. The kids and I have hours and hours of noisy balloons flying around, and giggling, laughing kids chasing them. Sometimes I carry them in my purse to play with in the park. 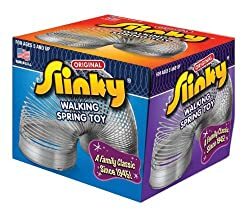 The Original Slinky: Who doesn’t like to play with the slinky. Light Up Twirler: Another great toy to stick in the car with you. Gubs: Gubs is one of our favorite family games. It is quick, but not too short, you can be competitive, or take it easy. It is simple enough to learn for anyone that can read, as the instructions are on every card, describing what is it’s purpose. Led Light Up Frisbee: This is one of the best toys created ever! We spend hours playing outside at night. The whole family. Anytime the weather is mild we will be in the soccer field of the high school playing away with this Frisbee. Along with the game of Gubs, LED Frisbee is my go to presents. Perplexus: My youngest was obsessed with Perplexus, and for a good reason. They are challenging and different. Yo Yo: I haven’t met anyone that doesn’t enjoy yoyo-ing (is there a word like that?). Even cooler if you learn some amazing tricks to do with the yo yo. Makey Makey Kit: This one was a lot of fun for a long period of time. I have to admit though, now it’s in the closet for a while. The kids had a great time making a banana keyboard and more. Munchkin Game: Munchkin game takes a while to learn. It was not easy for my youngest. The teens love it and can spend hours playing! A Kite: Not just any kite, a pocket kite that is great to keep in the back of the car for a windy day at the park. Rubiks Cube: I didn’t think that Rubiks Cube was this exciting, until we all decided to learn the solution to it. 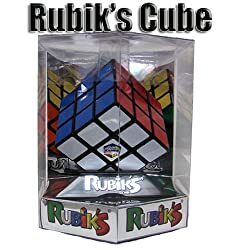 You can find the video we used here: Rubiks Cube Solution, but there are lots of options out there. Jenga: The reason I like Jenga so much is because it’s just an easy way to spend an enjoyable few hours with your kids. Big Book Of Search And Find: I realize that I put a book here, in the toy list. This is not an actual book, it has lots of family fun packed into it’s pages. We have spent much time together looking for the items on the list. We would make it a race, and the person that would spot the item would get a counter. The one with the most counters wins. There are many pages loaded with excitement. Blockus: Awesome game, as long as you don’t lose the pieces. Kanoodle: Kanoodle is a 2-D puzzle, akin to the Rubiks Cube. Backgammon: One of our favorite games of all time. We spend many winter afternoons playing Backgammon. There are several ways you can play (though only one is usually described in instructions). Buddha Board: Buddha Board is not exactly a toy, but it was the best thing I have gotten for our household. The kids and adults enjoy it, all the time. I actually bought the mini ones, and would like to invest into a big one this year. Do you have some favorite games or toys? Share them in the comments below.